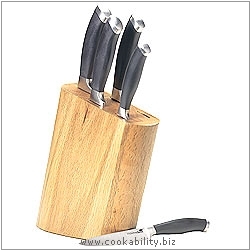 Masterclass brushed stainless steel knives with double bolstered handles. All knifes are fully forged, taper ground bladed with plain cutting edge apart from the bread knife which is serrated. All have easy grip ergonomic handles. The set comprises: 20cm chefs knife, 20cm carving knife, 20cm bread knife, 13cm utility knife, 8cm paring knife, oak knife block.